Geithner says he wrote the book to explain why he took certain decisions to save the financial system, even if many of them fueled the American public's anger. At the height of the financial crisis, former President Bill Clinton tried to brace then-Treasury Secretary Tim Geithner about the growing populist anger over the government's Wall Street bailouts. "You could take (Goldman Sachs (GS) CEO) Lloyd Blankfein into a dark alley and slit his throat and it would satisfy them for about two days. [T]hen the bloodlust would rise again," Geithner writes in his new book, "Stress Test: Reflections on Financial Crises." The book is due out on Monday, but CNNMoney purchased a copy at a store on Friday. 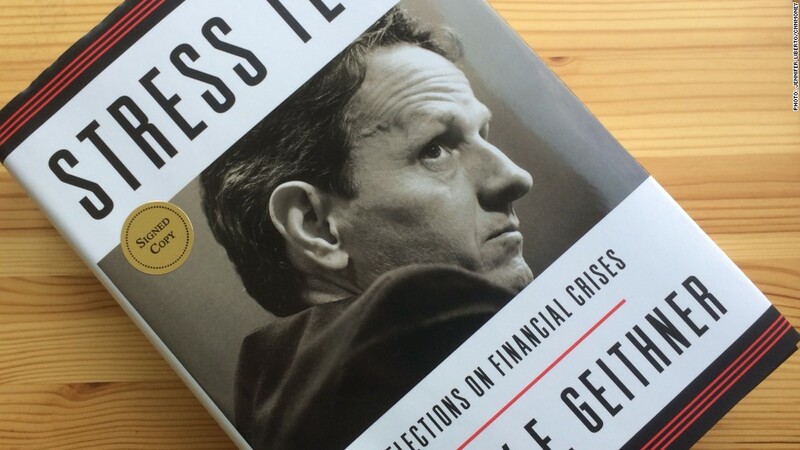 Geithner says he wrote the book to explain why he took certain decisions to save the financial system, even if many of them fueled public anger. He jokes that he was probably "personally responsible" for the birth of the tea party, which was dead set against the rescue of the banks. "The public despised our financial rescues," Geithner writes. "Conventional wisdom still holds that we abandoned Main Street to protect Wall Street -- except on Wall Street." Geithner takes the blame for those perceptions and wrote that he's "proud of most of the decisions we made to try to save the economy." But he says he didn't do a good job communicating their rationale. "I never found an effective way to explain to the public what we were doing and why," wrote Geithner. Geithner, 52, served as Treasury secretary throughout President Obama's first term. Prior to that he was president of the New York Federal Reserve starting in 2003. His tenure coincided with the massive rise and collapse of American home prices and the flood of foreclosures that rippled through housing and ultimately led to the near-collapse of the global financial system. In the early days of the crisis, Geithner worked closely with then-Treasury Secretary Hank Paulson and Federal Reserve chief Ben Bernanke. Geithner writes about the time he got word that British banking authorities nixed a deal for Barclays to acquire investment bank Lehman Brothers. He remembers walking into Paulson's office and saying: "We're f--ed." Lehman promptly filed for bankruptcy. And then, days later, the government decided to bail out global insurance company American International Group (AIG). The move to save AIG surprised even JPMorgan Chase (JPJQL) CEO Jamie Dimon. 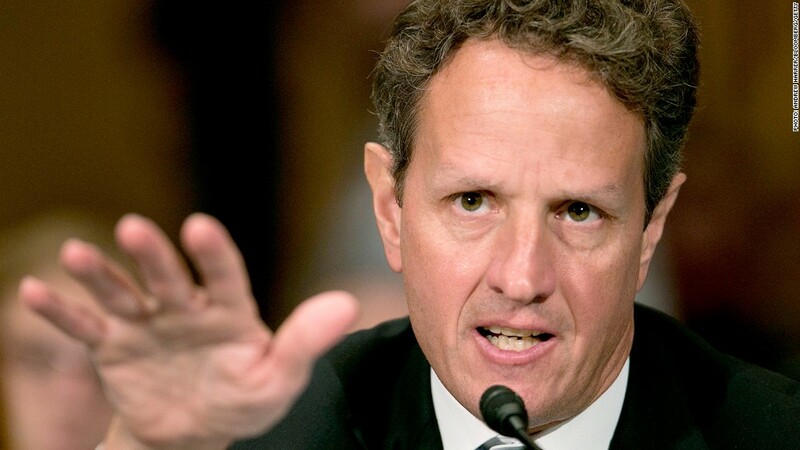 Geithner writes that Dimon told him: "I don't know if I would've done that if I were you." One of the most hated moves of the financial rescue -- allowing bonuses for AIG bankers to go through -- was a tough sell to Obama, Geithner wrote. But he and others at Treasury didn't believe Washington could stop them. "Let me get this straight. We're going to pay bonuses to the very people who caused all this damage to the financial system," Obama asked Geithner, according to the book. "And, by the way, a lot of them live in London so we won't even collect taxes on their bonuses?" Geithner is hard on himself. At the height of the crisis, he was aware that people said he had a permanent "deer in headlights" look about him. He felt he lacked "gravitas" and was politically damaged because of grueling confirmation hearings that focused on troubles with his taxes. Over his tenure, Geithner testified before Congress 67 times. He said he offered his resignation to Obama several times "when 'embattled' seemed to be part of my title." During his tenure in Washington, Geithner says he testified before Congress 67 times. He quotes boxer Mike Tyson: "Everyone's got a strategy until they get punched in the face." Geithner also takes aim at one of his toughest critics, Neil Barofsky, who was appointed as a watchdog for the TARP bailout. Geithner accuses Barofsky of lacking enough financial knowledge and experience to have a broad view. "He assumed our motives were self-evidently sinister, as if we had helped banks for fun and profit rather than to cure a metastasizing financial crisis," Geithner wrote. Paulson apologized to Geithner twice during the crisis, Geithner wrote. The first time was when he failed to persuade the House to pass the TARP bailout bill. The second time was for "bequeathing me Barofsky."